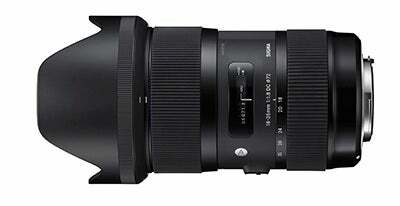 The Sigma 18-35mm f/1.8 DC HSM is the latest lens to be added to the company’s Art product line. Featuring a fast maximum aperture of f/1.8 and a focal length that’s equivalent to 27-52.5mm on Nikon APS-C DSLRs and 28.8-56mm on Canon DSLRs, it features a wide glass-moulded aspheric lens and the incorporation of SLD (special low dispersion) glass. The construction of the Sigma 18-35mm f/1.8 DC HSM is made up of 17 glass elements in 12 groups, with nine rounded diaphragm blades to create an attractive circular bokeh at large-aperture settings. Sigma’s Hyper Sonic Motor (HSM) is also featured to ensure the AF performance is both fast and silent. By optimising an AF algorithm, Sigma claim a smoother autofocus performance has been achieved. The lens also supports full-time manual focusing. The new Sigma 18-35mm f/1.8 DC HSM features a 28cm minimum focusing distance and weighs 810g. Convenient handling of the Sigma 18-35mm f/1.8 DC HSM is achieved by incorporating internal focusing and zooming, which prevents any change in the length of the lens when focusing and zooming. The benefit of this is that the front element doesn’t rotate, making it easier to use when attaching filters such as circular polarisers. Sigma’s Super Multi-Layer Coating is employed to reduce flare and ghosting, while the supplied petal type lens hood (LH780-06) also provides extra protection from flare and ghosting. Modifications to the lens cap and AF/MF switch have also been made, while on the lens barrel, Sigma has taken the approach of engraving the last three digits of its release year so the lens can be easily identified according to the year of its launch. At the time of writing, no pricing or availability information is available.